Beef, Pork, Veal, Lamb, Poultry, Fowl, Fish and Game. Variety is indeed the spice of life! Victorian cookbooks cover meat recipes in extensive detail. The recipes are generally divided by type of animal. A chapter will typically begin with how to choose the best animal when at market (always shop with the same seller so as to build rapport and not be swindled), followed by directions on how to butcher the animal or where the different cuts of meat are located on the animal. The homecook would have had considerable knowledge – and practice – in butchering, boning, trussing, and dressing various animals and cuts of meat. After covering of the basics, the author will present recipes that may – or may not – be organized based on how the animal is to be prepared: roasted, stewed, fried, in pies … There are plenty of options! 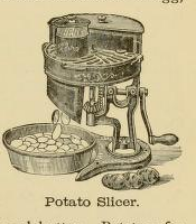 The excerpt below is from an 1870s cookbook. Of course, some authors went so far as to provide sketches of the different cuts on the carcass. To Choose Pork. If the rind of pork is tough and thick, and cannot easily be impressed with the finger, it is old. If fresh, the flesh will look cool and smooth; when moist or clammy it is stale. The knuckle is the first to become tainted. Pork is often what is called measly, and is then almost poisonous; measly pork may easily be detected; the fat being full of small kernels. Swill or still-fed pork is not fit for curing either dairy or corn fed is good. Fresh pork is in season from October to April. In cutting up a large hog, it is first cut in two down the back and belly. The chine [sic] or backbone should be cut out from each side the whole length, and is either boiled or roasted. The chine is considered the prime part. The sides of the hog are made into bacon, and the inside or ribs is cut with very little meat; this is the spare rib. All feathered friends were possible dinner dishes. Recipe collections include your standard chicken, turkey, and duck, but they also cover wild birds and songbirds alike. Do you remember that nursery rhyme line: “Four and twenty blackbirds baked in a pie?” No doubt that someone, somewhere, at sometime was eating raven or crow. Pigeons were a particularly popular dish. Housekeepers would raise pigeons for food, but also to sell for extra income at the local market. The lady of the meager house our country home would have been expected to care for, raise, and market her own flock of birds. To that end, cookbooks often included a section on animal husbandry for various kinds of birds. Carving birds was as big of an ordeal 150 years ago as it is today! The presentation. The show. The expectation. Again, diagrams with step-by-step instructions helped our cooks navigate the complexities of Victorian etiquette when faced with a large roast turkey. Fish dishes were common on menus, but by no means were chefs limited to just fish. Victorian cookbooks include a wide variety of recipes that included bounty from both fresh and saltwater bodies. If you enjoyed shellfish, shrimp, oysters, lobster, eel – and more – you’re in luck! Oysters in particular were a popular starter or side dish. Easily harvested, they served as quick, delicious appetizers. If you could catch it in the water, you would probably find it on your plate or in your bowl. Interested in learning more about Victorian Era cooking? Feel free to explore Convivial Supper.